It is with great pride that the Roadmaster Booking Agency announces the first European tour of the latest revelation of Californian death metal: Skeletal Remains. The tour is the result of collective effort between the band, the Roadmaster Booking Agency and the German label Rekotz FDA. The tour will take place in July and August and has dates available for Germany, Holland, Belgium, the Czech Republic, Austria, Switzerland and Italy. It’s completely mind blowing! All we ever did as kids in high/middle school is talking about how badass it would be to tour, all the great stories we would have and the people we would meet. Not only is this our first tour, but a European tour!? It’s definitely a confidence boost for us to have our first tour in Europe. Just tells us we’re doing something right (for once haha). 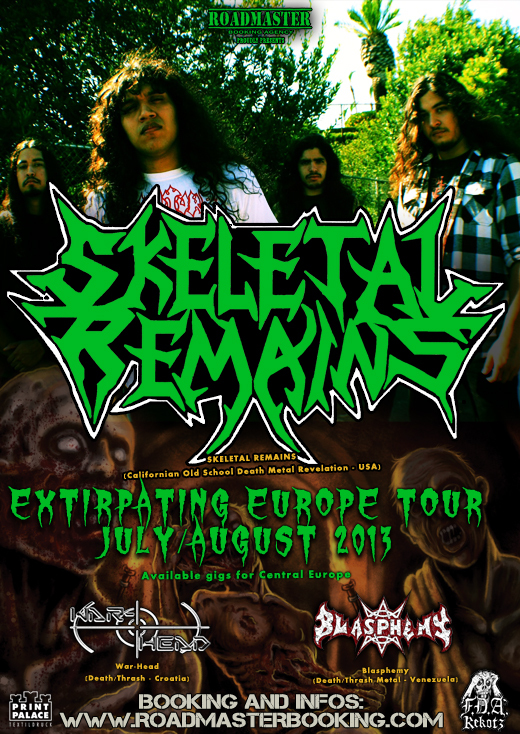 We can´t wait to get out there and show the European metallers what Skeletal Remains is all about. Roadmaster booking are the ones making this whole tour possible! They’re doing whatever they can to get us out there and we can’t thank them enough for everything they’re doing. From booking the shows to transportation. All we’re doing is showing up to play, everything else is being done by them. So you can get an idea on how much they’re putting into this. The European bangers can expect full on old school skull crushing death Metal! It will be full of energy, non stop head banging madness that will keep you screaming for more! We can not wait to get of there and rage with all you maniacs!